A rump roast beef dinner draws meat lovers with the promise of a down-home delicious meal any way you make it. Plus, the roast is so versatile as leftovers in an array of variety that is limited only by our imagination. I like to use Rump Roast because it is so flexible and tender. The only problem I have is that sometimes the butcher leaves too much fat and I trim it off. Today's Rump Roast is perfect, about 4 pounds with just a patch of fat covering about 1/4 of the top side. Remember, I tend to cook by feel, based on what ingredients I have on hand. Feel free to make any changes for your palate. I did not cook carrots with the roast because I was preparing a meal that would include a guest that does not care for them. You can always add carrots with the potatoes or take some of the beef broth from the slow cooker and prepare them on the stovetop or in a microwave, I have done both and that broth makes all the difference in the taste just like Mom used to make. 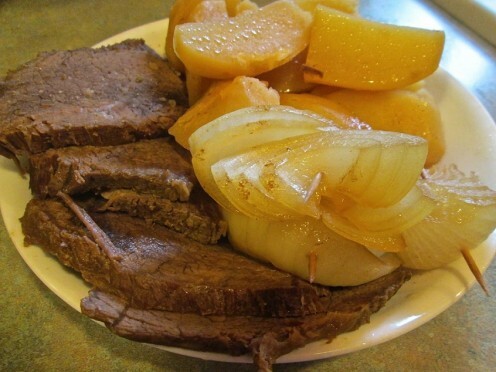 Let us get going on the Slow Cooker Beef Roast with Onions and Potatoes. Yields: Dinner for four or more. Mix Bullion, Mustard, Pepper, and Garlic together to form a paste and spread it over the surface of the roast. Put the roast in a gallon size Zip Lock bag. Add: 3/4 Cup Merlot Cooking Wine or regular Merlot drinking wine. Zip the bag shut and marinate a few hours or, over night in the refrigerator, turning the bag every now and then to distribute the Merlot. Remove meat from bag and place the Rump Roast and merlot in slow cooker and add the prepared broth. I use 3 standard cans of fat free and low sodium beef broth. Cook on high for 1/2 hour and then reduce to medium heat for 3 hours. Peel and quarter 4 medium potatoes. Place potatoes in slow cooker on high heat. Peel and quarter a medium or large sweet onion and skewer with tooth picks to hold together. 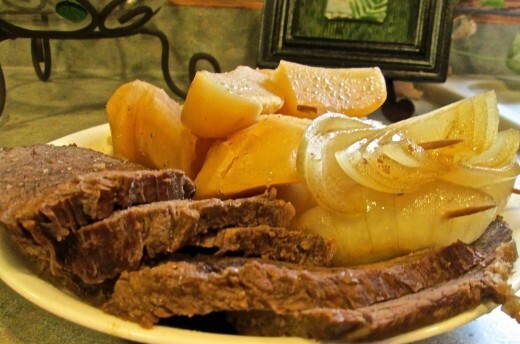 Place quartered onions in the slow cooker and place the roast beef slices that you will be using for the meal back into the slow cooker for a 1/2 hour or more. Package up portions of the Rump Roast slices and refrigerate or freeze according to when you will be using them. Remember, you may just want a roast beef sandwich tomorrow. Roast beef, potatoes and onions dinner. Just add carrots! Some say crock pot and some say slow cooker. Whatever, these pots are great for cooking a pot roast in and tossing in the veggies. They just make life easier for active people with other things to do during the day and I still have it for when guest are coming to visit. I got my first crock pot as a wedding gift and have had it for many years, and it still works. I got a larger one when I had three children living at home. A multi-cooker is great for game, even fish, chickens, pork, beef, or anything your heart desires. I cook the Rump Roast dinner in a slow cooker. You may need to adjust the heat settings and time by your experience with what you are cooking in. I did not add salt because there is plenty in added ingredients, but feel free to add to your palates preference. Add your favorite ingredients as options. I hope that you will try my crock pot dinner recipe. I love using a slower cooker for meats and main dishes. It makes the house smell so good for hours. If you need to go to work its easy to have a hot meal ready to eat at the end of the day. The slow cookers come in several different sizes and colors. Crock pots make wonderful house warming gifts, wedding gifts, or a gift for any occasion for people who love a home cooked meal but do not have a lot time to spend in the kitchen. I hope you got some great tips from my Roast Beef Dinner Recipe and cooking style. Thank you for stopping by. 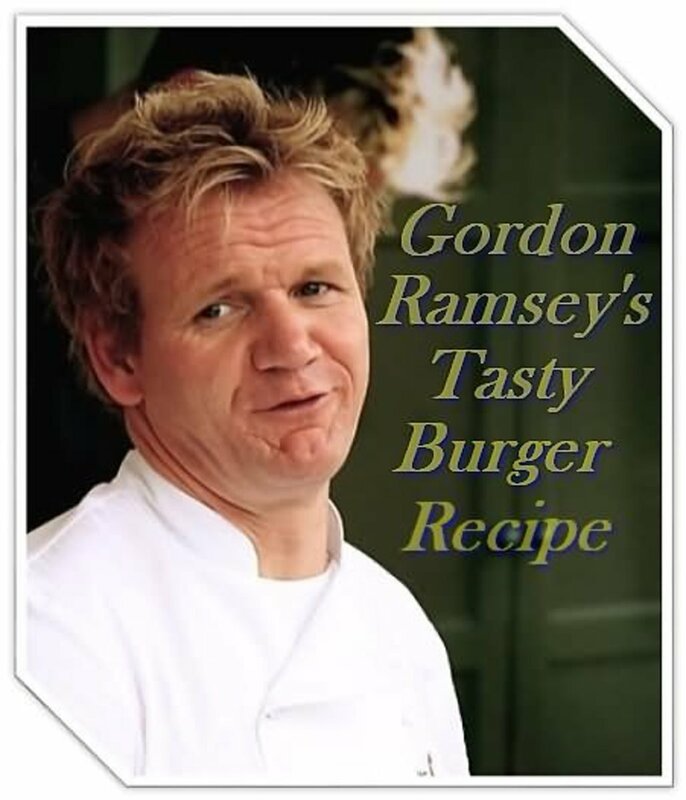 I have a whole collection of My Own Original Recipes if you are interested in checking some of them out Here. Pot roast with potatoes and carrots. Many times when I was growing up Mom would cook a beef roast in a roast in the oven and add the peeled potatoes and carrots for a family sit down meal. I believe it was one of my Dad's favorite meals. It ready was and is still a meal fit for a king. One thing Dad always had to have with dinner or lunch was a piece of buttered bread or toast. Usually, it was Mom homemade wheat bread. I have to agree with him, that this delicious dinner is even better with a good slice of bread. Thank you so much Peggy. I hope 2017 is a healthy and happy for you. I made a pork roast in a slow cooker for lunch today and it tasted so good, great after taste too. Winter months are the perfect time to try out recipes such as your roast beef in the crock pot. It also makes the house smell so good! Wishing you a very happy new year Susie. Hope 2017 is kind to you and brings you much happiness. Ms. Clark, I can related to certain meals being comforting food on those cold blustery days. Seems to be my favorite times to cook and bake, its become and indoors activities for so many of us. Cold salads on hot days, etc. Thank you for coming by, and Happy New Years in 2017. Here in North Texas we are recovering from temps that dipped down to 30 F. I know it gets much colder up north -- I'm originally from WI and I know all about cold. Just the same, with wind at 19 mph and actual temp only 30, it's a little chilly out there. We're to get to 39 for a high and then drop down to 24 F. tonight. I tell you about our weather because this meal looks perfect for a day like we're having today in N. TX. 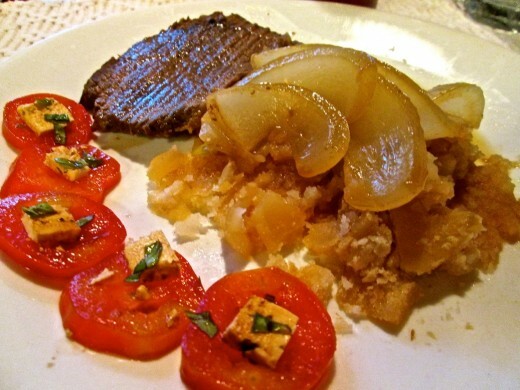 I love onions and they look yummy on that plate! 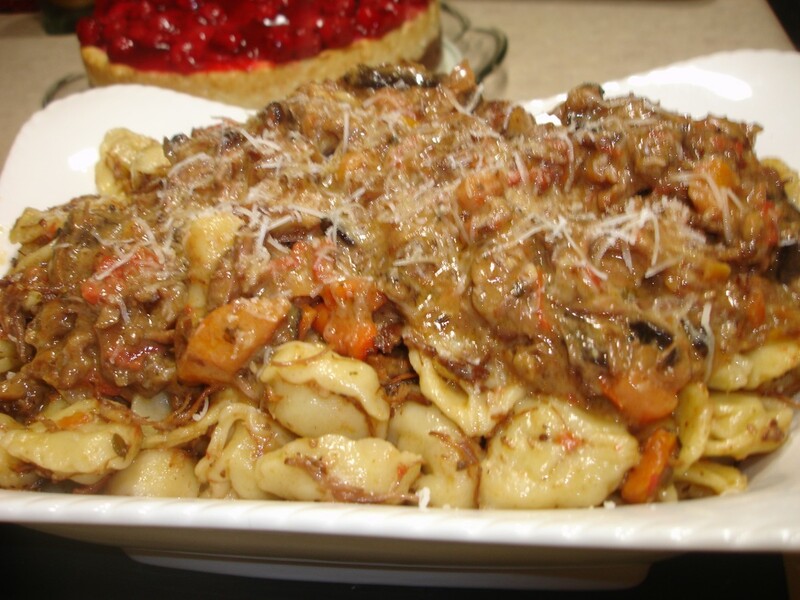 This meal is picture perfect for a cold, blustery day! Peggy, that's my plan again now that the weather is rather cool here. Enjoy some blessed meals through the cold season. - Kudos! Patrica, once the weather gets cool to cold, those crook pots and slow cookers are nice to have going for the warmth and aroma. Thank you for coming by. - Kudos! We recently tried a new beef roast recipe in our crock pot that was not to our liking. I cooked more potatoes and carrots and made some hash out of it. Your recipe would be good...no guessing as to results. At least we got our crock pot out of hiding (Ha!) and used it again. Plan to use it more often. Just pulled out my crock pot today to make bean soup...I use it a LOT in fall and winter. I have not made a roast in a longgggggg time but I think I can smell this one cooking....thank you again for a luscious recipe. Sandy, that happens to me when I visit recipe hubs, that biological reaction kicks in. Thank you m'dear! Au fait, I got a nice beef roast that I plan to cook soon. Its been cool weather, we even got snow Fri. and Sat. Using a slow cooker is perfect to use when its cool, it does help heat the house and makes it smell sooooo good! - Thanks! Peggy, I live cooking a beef roast or a venison roast on a crock pot anytime of year for dinner. The left-overs are always delightful for hot or cold sandwiches and I feel like I could go for one right now. Thanks for visiting! This is getting me hungry. Love pot roast. That meal looks so yummy and scrumptious! I bet it tastes soooo good! What could be easier than a slow cooker? You are a great inspiration to get people trying something new and getting that slow cooker out of storage! Taking a look at this good recipe of yours again has inspired me to use our crock pot more often. In the heat of the summer it could also help save on our electricity costs. Your photos make this look so appetizing! Dolores, its very nice to have you stop by, thank you for leaving a comments so I could know you were here. I love cooking easy, and smelling the aroma for hours on end. - Happy Easter to you! Au fait, your winter days are usually looking like spring or summer weather to me. I don't mind this cold climate up north as long as I don't have to be out in for too long. A nice roast beef meal warms us from the inside out. Thanks for visiting. There's nothing more delicious than a slow cooked beef, especially as a winter treat when company is coming. I have not been successful cooking a roast in my slow cooker and usually opt for the oven. The beef I cooked in the crock pot was under done. This looks so delicious! We're having perfect weather here in North Texas for a meal like this -- strong cold winds and rain. Today is a winter day. Usually we have upper 60s and 70s. This looks like a yummy 'comfort' meal. Thelma, I just got hungry for some tender roast beef dinner myself. Matter of fact I thought I just got a whiff of that wonderful aroma. - Kudos! I have not made roast beef for a while. Maybe this Christmas. Reading this makes me hungry. LOL! Jonny, I appreciate that. It is a great meal, and I will throw in the carrots. I think a cast iron pan would do a nice job cooking this meal on a wood stove. It would give you some added iron too. - Thanks for visiting. Let me know when you are next cooking this, Susie. I will fly 10,000 miles to join you! Lol! I don't have a power supply that will support a slow cooker, so will try to get a cast iron pot to place on top of my wood stove, and work how to keep it hot enough for cooking. I think it will work. Nice recipe must try it, love all meals cooked in a slow cooker, being your recipe it will be perfect. I'm a crock pot user but I call it a slow cooker, by your poll it seems crockpot has got it, may be I will have to change what I call it. Peach, with a roast beef dinner I like potatoes. do you eat with rice or just this dish? Sheila, its really hard to beat a tender juicy pot roast cooked with veggies. Thank you for your support m'dear. This sounds so good! 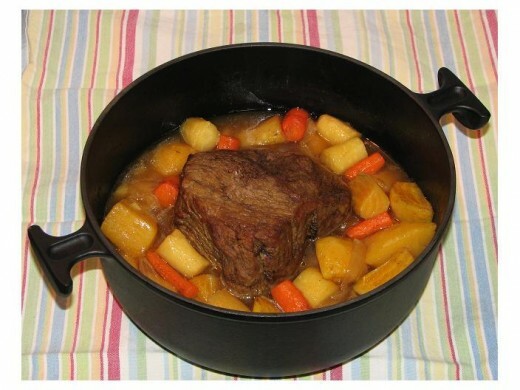 A good pot roast in one of my favorite meals! Your recipe sounds awesome! I am pinning this for sure! Patrica (ps), thank you for your lovely comment and angel blessing. May they bless you each day! 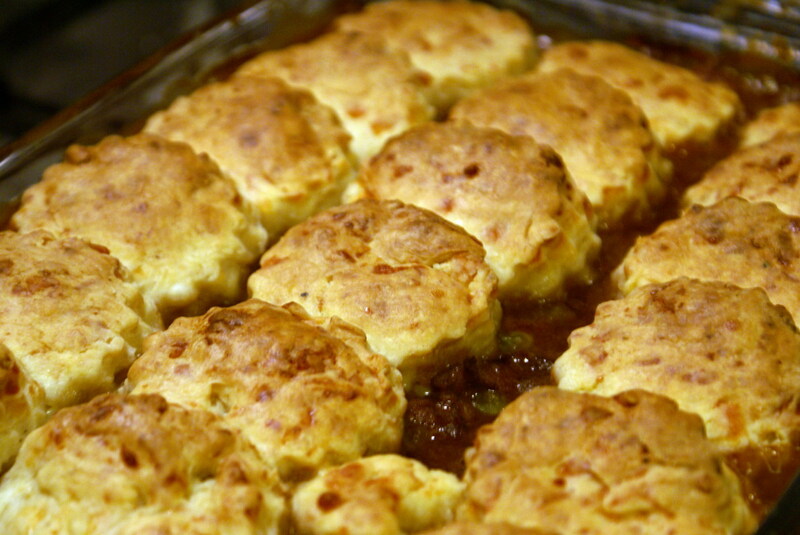 Peggy, I sure do appreciate you for sharing this recipe hub again.Thank you very much! Yummy,..I love the recipe and I can't to make it soon with my mother. Thanks for writing and sharing with us. Voted up! Oh yes...a crock pot for roasting beef is so lovely. It simmers and tempts us all day as it readies our food. Thanks for sharing your method...I will give it a try. This entire meal looks great. Potatoes and onions are a must. In fact, the carrots from the video are also a plus. Hi Marlene. Yes, I usually do add the carrots with a pot roast and potatoes. I love them! - Thank you for visiting! Hi Thelma. A pressure cooker is a great way to prepare a tender roast. That is how my Mom use to cook them for canning meat. That just brought back good memories. I got some good tips here. I like the recipe and would definitely add the carrots. Thank you for sharing this delicious dish with us. You are right, Flourish, the merlot gives a lovely taste that I do like very much. I like to experiment while cooking and find some wonderful ingredients for recipes by happy accident. - Thank you! Reading this hub makes me hungry although I have just eaten my dinner. LOL! I have not done roast beef in a slow cooker but in my pressure cooker. Thanks for sharing the recipe. Joel, cooking in a slow cooker is a great way to fix dinner while we are busy doing something else. And, I see that you have plenty of experience cooking this way. - I appreciate your visit, thank you! Yes, I do have crock pot chicken recipes, Peach. Maybe one day I will get some published on HubPages. - Thanks m'dear. Catherine, I wish I had some leftovers for lunch today. Thanks for checking out my dinner recipe. Brilliantly put together. I like your style of cooking and this recipe looks so delicious. I bet my husband would enjoy this. I suspect the merlot gives it a nice flavor. Now, being a single old man, I do a lot of crock pot cooking. It allows me to "cook" in the morning and then eat whenever I please throught the day. I've learned to use recipes such as this to create one meal out of another...with the roast beef, it will turn into a vegatable soup on the third day. HubPages is now my "go to" source before I go food shopping. I've found that HP provides the perfect global cookbook. Great recipe--it is now on this week's shopping list--Thanks! Peggy, anyway I fix a rump roast, I like it, as long as its tender. Have a wonderful day, and thank you. do you have chicken recipes for crock pot? You're pictures are so mouth-watering. I have a new crock pot and I think I ought to try it out with this recipe. Voted up and shared. So wishing I was walking in the door to the smell of roast beef dinner. 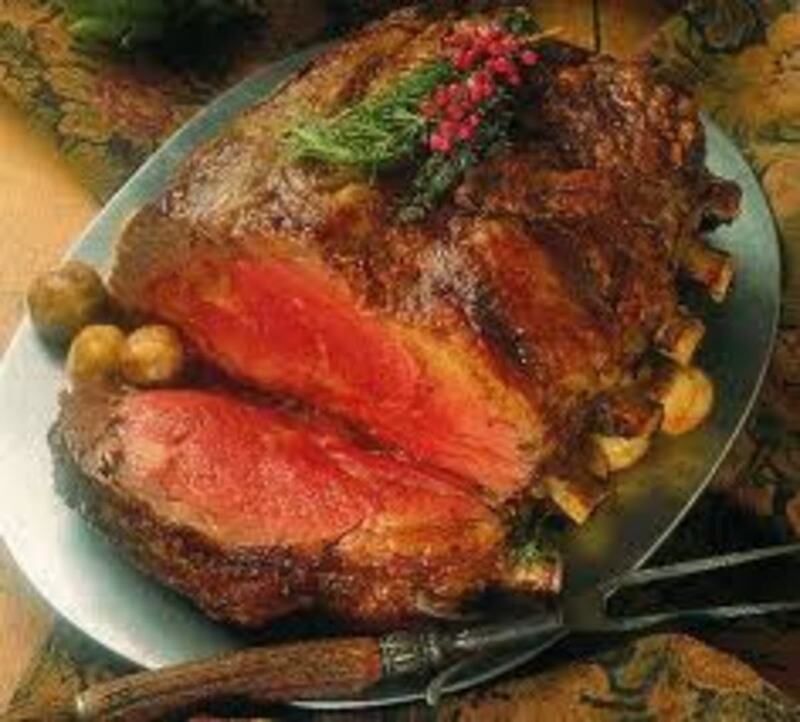 I love a good beef roast although I generally cook mine in the oven after first browning on the stove. I have tried a few new recipes lately using a New Mexico cookbook that I purchased years ago. We have been enjoying some of the new flavors. Green chilis gave it a mild but flavorful difference. Yours sounds great but I would want the carrots included. They are so flavorful when roasted together with a beef roast! I should haul out my slow cooker and use it more often. June, you are correct in your assumption. Thank you so much for coming by my newest recipe hub. I assume that you remove the meat from the ziplock bag before putting it in the slow cooker? And the merlow mixture goes in the slow cooker also? Sounds good to me, @mrducksmrnot. I do like venison and wish I had a roast to cook up. - Thank you! Peach, a slow cooker is great for preparing a meal in one pot. can crock pot really make such delicious dinner? I'm hungry after reading this. I am going to use my deer meat roast instead. I know what I'll be eating for the next few days. Thanks for the wonderful "Grandma's Kithen" receipe. 5 stars.